To start off with learning to play the violin is tough, therefore selecting the right size is crucially important in offering the student all the encouragement and support they need. If the violin feels good, sounds good then the student is more likely to stay on course and develop the skills necessary that will benefit them all their playing lives, so it’s vitally important that the selection you make is well matched to the student. So as a parent/beginner you’re not alone in feeling overwhelmed when choosing a violin for a beginner student and the many different violins available. How many different sizes of the violin are there? Violins come in 8 main sizes. The size corresponds to the length of the body of the violin (not including the neck and scroll). The smallest common size is 1/16 (just 9 inches or 23 cm), and the sizes work their way up through 1/10, 1/8, 1/4, 1/2, 3/4, 7/8 and finally 4/4 or full size (about 14 inches or 36 cm). Most adults (and many children from around age 10+) will require a full-size violin. It depends on the length of your arm and what you feel you can hold comfortably. When holding up a violin, it should not feel too heavy and it should be possible to grip the top of the fingerboard with your hand, while still bending your arm easily at the elbow. If an adult feels more comfortable doing this on a 7/8, then it’s fine for them to play a violin of this size. What size violin should I buy for my 5-year-old? Similar to buying shoes, there is no easy rule about children’s ages and violin sizes, it’s best to measure to get the correct size for each child. 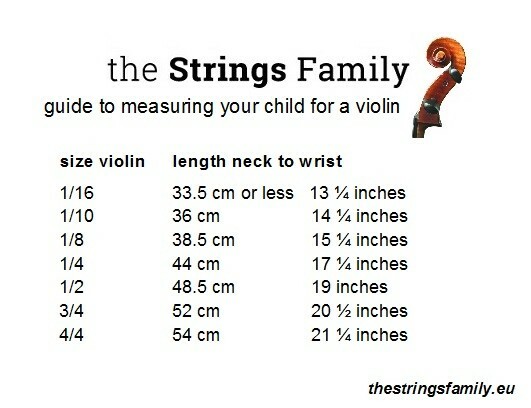 How do I measure my child for a violin? Have your child stand up straight and hold out their left arm with their palm facing upwards. Measure from the left side of their neck to their wrist. Check the length in cm or inches against the table. When is a good time to move to a bigger size? Children tend to adapt quickly to a bigger size of instrument, so I usually advise just to go ahead with a bigger violin whenever your child is ready. If possible, it’s best to allow a few weeks to get used to the bigger size before playing in a concert or exam. Occasionally, a teacher will hold back a child from moving up a size for a couple of months to develop their bow technique and make their arm just a bit stronger before the jump up. So consultation with the teacher here is always good. So if in doubt, it’s always best to ask in store to get your child to try a violin and get the right size that will enable them too fully develop their skills and make your purchase a worthwhile investment that will benefit you and the student. If you would like more information on violin sizes or would like to test different sizes then pop into your local store for some assistance. Our staff will be on hand to help you out.